Fabric Mart Fabricistas: Second Challenge Announced! Like the pop culture weekly, Who Wore it Best, we want to know who made it best. 9 Seamstresses will compete in this challenge. Challenge: Using the pattern that we have selected for you, create a unique garment that reflects your personality. You can alter the pattern or add to the pattern to make it more you. Think of one of two words that describe you to inspire your look. This challenge will be judged on creativity, craftsmanship, how well represented your two words are in your design, difficulty, and fit. Salme is an independent pattern company that offers PDF patterns. You receive your pattern quickly and just need to print at home, cut and sew! Personally I think this pattern (as presented) would only work for a young woman with a young girl figure. That said I am anxious to see how the mature women contestants adapt and create their garments as this will surely be a challenge! We choose this pattern as a challenge. We want to see how the older women make this piece more mature and how they alter it to fit them. It was not meant to be easy! wow that is going to be quite a challenge. The ladies are all different shapes and sizes and this style really won't work on all of them as is. I look forward to seeing how the clever sewists adapt this pattern/style to work for them. some larger ladies may find this one harder to pull off than those who can wear a waisted style which has a definite 'young' look to it. 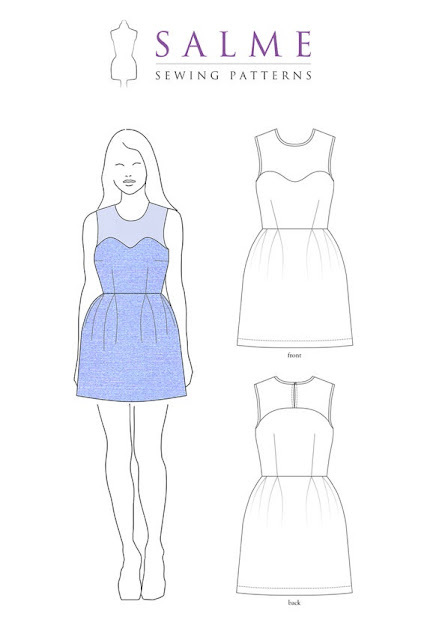 I think this contest challenge is a great idea, however this dress pattern for challenge #2 is a poor choice IMHO. The dress is geared for a young woman or girl not a mature woman. I am only glad that you have the wisdom to allow for contestants to change/alter the pattern as presented. I'm anxious to see what these talented woman produce. I look forward to seeing the results.... I would love to see how it is manipulated for the mature woman.